Fabulous and Brunette: Daughter of Madness by Amanda J. McGee - Book Tour - Guest Post - Giveaway - Enter Daily! 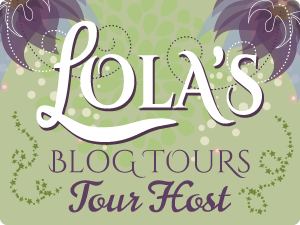 Daughter of Madness by Amanda J. McGee - Book Tour - Guest Post - Giveaway - Enter Daily! Hi lovelies! It gives me great pleasure today to host Amanda J. McGee and her new book, “Daughter of Madness”! For other stops on her Goddess Fish Promotions Book Tour, please click on the banner above or any of the images in this post – except the Available at Amazon picture. 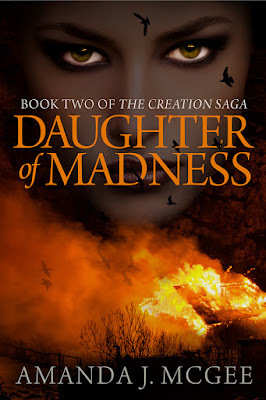 Be sure to make it to the end of this post to enter to win a copy of BOTH books in The Creation Saga Book Series – Book One, “Mother of Creation,” and Book Two, the featured book, “Daughter of Madness”!! Also, come back daily to interact with Amanda and to increase your chances of winning! There are six viewpoint characters in The Creation Saga. Daughter of Madness is the second installment, and my first time writing a sequel. It’s been a lot of fun watching my characters grow through these new adventures, and it’s hard to pick just one who I identify with the most. 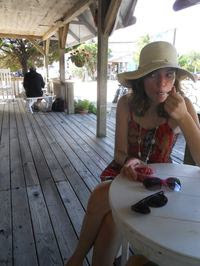 I think as an author you have to find ways to identify with all of your characters, at least a little. That said, the character I have felt the closest to in this book is definitely Liander. Liander spends a lot of time in this series providing another lens through which to see Liana, his sister and the protagonist, but that’s not all he is. At his core, Liander is faithful, but he’s also flawed. He consistently makes mistakes that hurt others, and in this book he is coming to terms with the fact that he can’t ever fix those mistakes. The past will always be there. The only thing he can do is try to be better, to be there for his sister - even when being there for her means that he engages in some really messed up stuff. In turn, Liander becomes a path through which Liana can find her compassion, if she decides to. I think one of the reasons I like Liander so much is that it would be easy for him to double down and not learn from what has happened to him. It would be easy for him to insist that the things that happen to his sister in the first book are no fault of his, that she should have been smarter or let him keep her in a box. And when she goes down her own dark road in response, he could decide to abandon her, or not support her. He does neither of those things. Liander learns from his mistakes, and if they aren’t always the right lessons they aren’t the worst conclusions he could draw. Guilt is what makes it hard for him to see his path, but guilt is also what helps him grow. Guilt and love sometimes find themselves good company, when we have failed someone. Liander’s guilt arguably causes him to make more mistakes, and he shares a lot of blame for the actions he takes to support Liana when she’s not in the right. But their relationship continues to inspire me. It’s so important to have someone who will back you up, who you know will be there for you if things don’t go well. I think we all want to have that and be that for someone. At his heart, Liander still believes in loyalty to his family above all other things, and there’s something admirable in that no matter what things he does or fails to do. I hope readers find as much to love in Liander and Liana’s relationship as I have. It’s nice to have some spots of hope amidst all the conflict in the plot. Amanda will be awarding a copy of both published volumes of The Creation Saga: MOTHER OF CREATION and DAUGHTER OF MADNESS, (after the June 2, 2018 publishing date, US participants only) to a randomly drawn winner via Rafflecopter during the tour.